In NASA's news briefing about findings by the Mars Reconnaissance Orbiter they announced that they have significant evidence that liquid water is currently flowing on Mars. 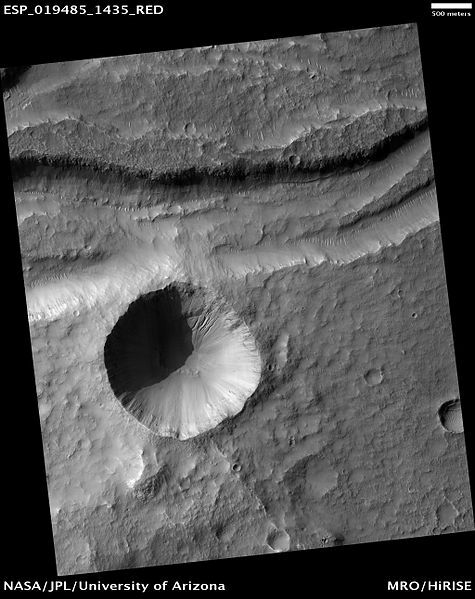 They used Newton Crater (below) as their focal point in the discussion and showed gullies that have gotten larger over the course of two and a half sol (Martian years) of observation. Newton Crater is about 10 km in diameter and a few hundred million years old (relatively new). It is just one of seven places that have distinct evidence of flowing water. 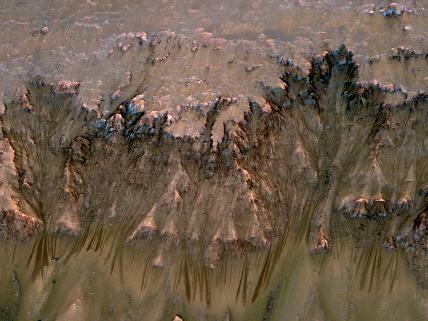 Below are pictures from NASA showing evidence of flowing water on Mars. These were taken during the warm season and may be evidence of salty liquid water (brine) active on Mars today. For more information on these pictures please see NASA's gallery. These new findings are all at mid-latitudes near the equator where it is warm enough that water can exist in liquid form. The fact that the water is very salty (called brine water) enables it to remain liquid even in temperatures below freezing. On the thermal map below you can see that the previous findings (white) of ice that were found due to meteorite impacts were at higher latitudes where it was much colder and the water was permanently turned to ice. 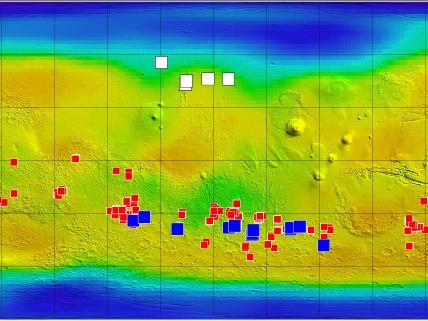 The new findings of possible liquid water on Mars (blue) are at mid-latitudes near the equator where the environment is much more conducive to maintaining water in its liquid form. The new evidence of flowing water is in the same place as many areas where salt minerals have been detected (red). This allows for the salt to mix with the water and create highly concentrated salt-water (brine). This brine does not evaporate or freeze as readily as pure water. The general consensus is that where liquid water exists, so does life. If there is brine that remains in its viscous, liquid state all year around that its ability to sustain life is unlimited. There are many organisms on earth that are able to sustain life in similar circumstances. There is a possibility that there could be a large layer of brine water under the crust that where life could exist. Even if the brine water discovered does freeze during the colder Martian seasons, there are many species that could become dormant during colder seasons. They would live in the brine when it is liquid, but become dormant when it freezes. Regardless of what this new evidence of liquid water flowing on Mars brings, it is a great discovery that brings us one step further to discovering if Mars was or is habitable.